Deputy Prime Minister Phạm Bình Minh said yesterday at the Việt Nam Summit 2016 that the country would continue to focus on restructuring the economy, renewing its growth model and integrating into the global production and value chain. Minh, who is also Minister of Foreign Affairs, said: "With a young and reasonably well-educated population, Việt Nam is poised to become an innovation hub in Southeast Asia." He said the country also attached great importance to "building a more transparent Government to serve its people and businesses". To create ideal conditions for investors, the Government has pledged to improve infrastructure, develop human resources and promote fair competition, he added. Minh said the two-day international summit in HCM City would act as a platform to help local and foreign businesses as well as global financial institutes better understand Việt Nam’s integration policies and development. Summit chairman Jon Fasman, who is bureau chief of The Economist magazine in Southeast Asia, said that Việt Nam’s economy was still going strong, even though growth in emerging markets appeared to be slowing. The Economist Intelligence Unit expects the country’s real GDP to grow by 6.8 per cent this year, and growth should be even higher next year, he said. Once one of the poorest countries in the world, Việt Nam has become a solid middle-income performer, while foreign direct investment (FDI) is surging, thanks to the government’s record of stable long-term economic planning. Investment is poised to increase further as Việt Nam will benefit from a number of impending trade deals, including the Trans-Pacific Partnership (TPP), Fasman noted. The 12-country pact involves the US and Japan, two of Việt Nam’s most important trading partners. Policymakers are also paying close attention to climate change, particularly in the Mekong Delta, which could become a centre for research and investment in sustainable business practices. However, drought has put the agriculture sector and water resources under severe stress, according to Fasman. However, there is still room for improvement on the economic front. The government has promised to privatise some state-owned enterprises, but private-sector efficiency has slumped, Fasman said. In addition, an escalation in geopolitical tensions could undermine strong economic ties throughout the region, he added. Andrew Staples, director of The Economist in Southeast Asia, said Việt Nam, with a young population and relatively low wages, was well positioned to develop into a global manufacturing powerhouse. But tech-driven innovations such as automation, digitisation and artificial intelligence are radically reshaping the manufacturing sector around the world, he said. Factories of the future won’t much resemble the labour-intensive plants of the past, so new production capacity is unlikely to drive mass employment. 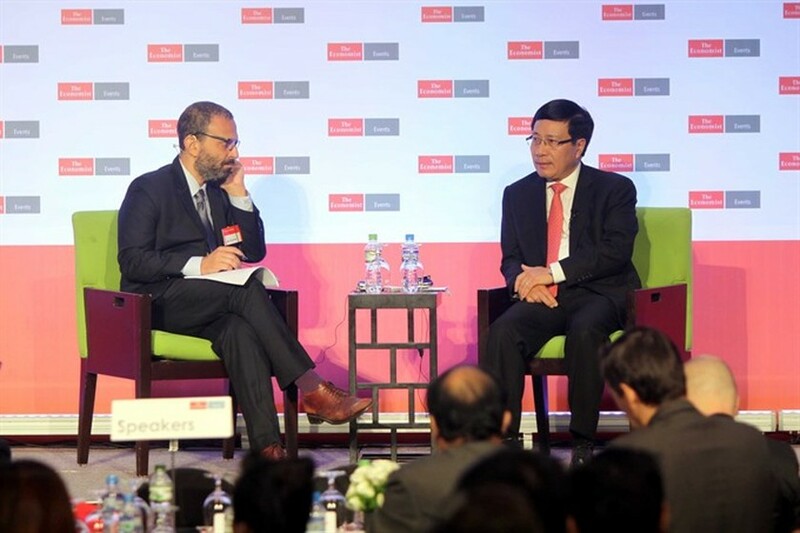 Thus, Việt Nam should be prepared for the shift and try its best to be at the forefront of the tech-focused manufacturing revolution, Staples said. In agriculture, Fasman pointed out that the Mekong Delta, which provides the country with most of its food supply and is a significant source of export income, remained under severe stress. The country’s agricultural products are often of poor quality and its supply chains lack transparency, leading to popular concerns about its low added-value position in the global supply chain. Việt Nam’s produce is widely exported, but it has not successfully created a globally recognised brand, he said, adding that the conference would discuss how to make Vietnamese rice, coffee and shrimp internationally recognised premium brands. Addressing the relationship between Việt Nam and China, Bùi Thanh Sơn, deputy minister of Foreign Affairs, said in spite of the East Sea dispute, Việt Nam and China had the potential to co-operate in many fields. “Việt Nam strongly supports resolution of the disputes in the East Sea by peaceful means, including diplomatic and legal processes. It also supports refraining from the use or threats to use force, in accordance with international law,” Sơn said. Last year, Việt Nam’s GDP topped US$200 billion and its per capita income was $2,100. Organised by the Ministry of Foreign Affairs and The Economist, the Việt Nam 2016 summit brings together leading voices from Government, business and finance, civil society and academia to discuss the opportunities and challenges facing Việt Nam. Featured topics included Việt Nam in the global economy, the future of manufacturing, feeding Việt Nam, building "Việt Nam Inc", the relationship between Việt Nam and China, geopolitics and the role of technology and social media to fight poverty.